This image is part of my 2nd one-man exhibit, entitled Pop! Nostalgia. It runs in Crucible Gallery, SM Megamall A from June 3-15, 2008. Now that is comic books and cosplay at their combined best! A fine example of butts kicking art. Great lighting! Oooooh I love this! Its great!!!!!!!!!!!!!!!! Hi Jay, hope you don't mind, I featured this piece on my website for fanboys. Here's the URL in case you want to check it out. wish though the last panel has more intensity. Whooooaaa! Now I'm shy to cosplay Rogue! *hides* LOL. Awesome! Real comic book art! Yay! Luv it! Oh wow I'm sooo jealous.. I Rogue!! And I this!! very nice concept!!! is it possible to book you this year? wicked! it just radiates uber coolness...! 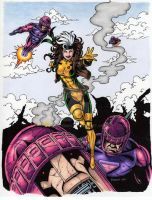 Awesome job, she looks just like Rogue! Which one? Stan? Or Jim? Judging from the art it's probably not Jim! Translating Jim's style into photography is quite.. hard. Hehehee.. his shadows were made using a cross hatch style. Now this is just really good. I love Marvel and I love your shots! Great job on the costume!